Another interesting Filipino horror film is about to be launched in the big screens. Directed by Randolf Longjas and written by Allan Habon, “Buy Now, Die Later” is undoubtedly one of the 2015 MMFF entries with the highest potential of winning the major awards. This exciting horror movie may be somewhat similar to the late 90s film series “Wishmaster”, it still has a lot of definitely shocking and terrifying scenes to watch out for. 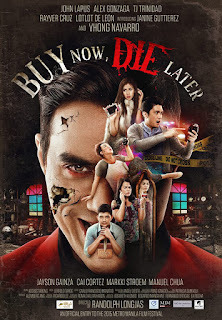 Leading the powerhouse cast of “Buy Now, Die Later” are Vhong Navarro, TJ Trinidad, Rayver Cruz, Alex Gonzaga, Lotlot de Leon, and Janine Gutierrez. The movie’s plot basically revolves around the story of five persons who, for some reasons, decided to accept an offer that will fulfill their personal or lustful desires in exchange of their soul. 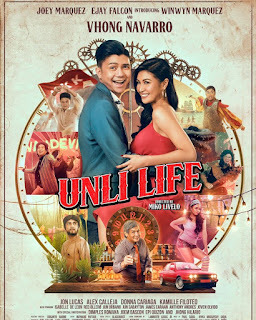 Nothing but superb acting performances blended with cutting edge CGI effects, and many other excellent film elements are expected in this MMFF horror entry. Upon seeing the full trailer on TV and several social media platforms, many avid fans of scary films and fans of the said lead stars have already expecting a whole new level of filmmaking excellence in this movie genre. This year’s MMFF is indeed stuffed with very promising film entries and of course, horror movies are among the main competitors. To some, the absence of a “Shake, Rattle, & Roll” entry may be sad news but to others, it is good news, believing that it’s better to see full-length horror movies like “Buy Now, Die Later” than to watch another set of 3 short-length films joined together as a franchise of the hall-of-famer horror trilogy. One thing’s for sure on December 25th – it would be a healthy competition this year for MMFF. Gone are the days where obviously senseless and lousy movies get to join in this film festival.